NAWCC Watch & Clock Bulletin article November/December 2014. I became interested in hallmarking to identify the date and origin of watches, but this naturally led on to an interest in hallmarking in general, which is what this page is all about. 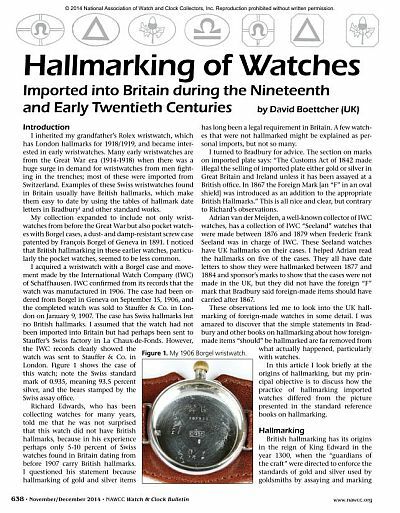 My particular findings about the hallmarking of watches imported into Britain during the nineteenth and early twentieth centuries is the subject of an article that was published in the NAWCC Watch & Clock Bulletin for November/December 2014 as shown here and which, thanks to permission from the Editor, you can download. NB: I will be publishing some corrections and additions to my NAWCC article that I will make available here. Gold and silver have been admired for thousands of years because of their intrinsic beauty and, because they are rare as well as beautiful, they have always been expensive. Pure gold and pure silver are relatively soft, they are made harder for practical use by alloying them with base metals such as copper. Because the amount of base metal added to the precious metal was originally small, the alloy was still termed gold or silver, as if it was the pure metal. Over the years the amount of base metal has been allowed to increase. However, the value of the alloy depends on the proportion of the precious metal it contains, but unlike standards of design and workmanship, which are readily apparent to the purchaser at the point of sale, the amount of gold or silver in the alloy cannot be detected by sight or touch and can only be accurately and reliably be determined by physical test. For over 700 years gold or silver used as coin or made into wares sold in Britain have been required by law to be of certain minimum standards of purity or "fineness", containing at least a specified proportion of precious metal, so that the buyer knows exactly what they are getting, and to protect the public from unscrupulous tradesmen who might dilute the precious metal with excessive amounts of base metal. In the year 1300 began the practice of marking some wares to show that they met the standard. These marks are now called hallmarks. The requirement continues unchanged today, and gold and silver items are still tested and hallmarked to show how much gold or silver is in the metal. This applies whether they were made in the UK or imported, and if items are not hallmarked with either UK or other recognised hallmarks, with some exceptions, they cannot be legally described as silver or gold. There have always been some exceptions from hallmarking for items that are too small or delicate to bear the marks, such as much jewellery and small items, and in recent years exceptions have been introduced for items over a certain age. However, even if not hallmarked the items must still be of legal standard; it is only legal to describe something as silver or gold if there is reasonable evidence that the item is actually silver or gold of legal fineness, such as it having British hallmarks, foreign hallmarks, been tested with one of the testing kits available, or some other reliable evidence. But caveat emptor: If any item is described as silver or gold and doesn't carry any hallmarks, it pays you to be very careful. Ask the vendor how they know it is what they say it is, and be cautious about the answer. With the difference in price between precious and base metals, it could be an expensive mistake. And if it has been tested with one of the testing kits available, bear in mind that they can only test the surface of the metal; it could be just a surface plating. Hallmarking guarantees that the metal is the same all the way through. Hallmarks are only applied to items made from solid alloys of gold or silver of minimum legal fineness. Because of the cost of gold and silver, making items from solid metal has always been expensive, over the years methods of applying a thin layer of the precious metal over a base metal have been developed. One of the first of these was Sheffield Plate, where two sheets of silver are welded to either side of a sheet of copper. This process puts relatively thick layers of metal onto the base metal, which will wear for many years before the base metal shows through. When the same process is done with gold the result is called "gold filled" (which may have the initials GF) or "rolled gold" (which may have the initials RG or RGP) depending on the thickness of the gold over the base metal, gold filled should be thicker, and therefore wear longer, than rolled gold. Because it is a mechanical process of bonding a sheet of precious metal onto base metal, the sheet can be made of an alloy such as sterling silver, or 18 or 14 carat gold. The thinnest layers of gold or silver are applied by electroplating, in which a thin layer of gold or silver is deposited chemically and which can range in thickness from ½ micron (1 micron is 1 millionth of an metre; one thousandth of a millimetre or 0.00004 inches) upwards. The quantity of gold or silver used on electroplated items is so small that it is essentially negligible and costs very little. The electroplating process involves dissolving a gold or silver salt in an electrolyte and then using an electric current to deposit pure gold or silver onto the item being plated. It is not possible to plate with an alloy such as sterling silver, or 18 or 14 carat gold; the electrical current carries the pure metal out of solution and deposits it on the workpiece. This means that electroplate looks very bright when it is new, because you are looking at pure gold or silver, but because the pure metals are soft they wear away quickly compared to the alloys. Electroplated gold items may have the initials GP or GEP. Electroplated silver items may have the initials EPNS, for ElectroPlated Nickel Silver. Gold is very soft and gold plate that is only ½ a micron thick will wear through very quickly. Better quality plating of between 1 to 20 microns will last longer, and heavy electroplating of around 100 micron thickness will last a lot longer. If you are buying an item that is plated and it means a lot to you or the person you are going to give it to, then find out about the quality and in particular the thickness of the layer of plating. It is ordained, That no Goldsmith of England, nor none otherwhere within the King's Dominion, shall from henceforth make, or cause to be made, any Manner of Vessel, Jewel, or any other Thing of Gold or Silver, except it be of good and true Allay, that is to say, Gold of a certain Touch and Silver of the Sterling Allay, or of better, at the Pleasure of him to whom the Work belongeth ; and that none work worse Silver than Money. And that no Manner of Vessel of Silver depart out of the Hands of the Workers, until it be essayed by the guardians of the craft ; and further, that it be marked with the Leopard's head (e q'ele soit signée de une teste de leopart) ; and that they work no worse Gold than of the Touch of Paris. And that the Wardens of the Craft shall go from Shop to Shop among the Goldsmiths, to Assay, if their Gold be of the same Touch that is spoken of before; and if they find any other than of the Touch aforesaid, the Gold shall be forfeit to the King. The requirement that gold wares be made from alloy "not worse than the touch of Paris" refers to a standard fineness for gold coins prevailing in Paris at the time (because there were no English gold coins) of nineteen and one fifth parts, or 19.2 carats, of gold in the pound Troy. In this context a carat is one twenty-fourth of a pound Troy. Silver must be of the fineness of sterling, which was also the standard for money at the time, (eleven ounces and two pennyweight of fine silver, or 11oz 2dwt, in pound the Troy), or better if the customer wanted it. Although standards of fineness are given for both gold and silver, there was no requirement to mark gold items. However, no silver vessel may "leave the hands of the workers" until it has been tested by the guardians of the craft and marked with the head of a leopard. It is sometimes said that a carat means simply one twenty-fourth part, but it should be noted that this is one twenty-fourth part by weight. Gold is so much denser than silver or copper, it weighs nearly twice as much for a given volume, that in gold alloy the alloying elements make up a much greater volume than their carat weight would suggest. For example, 18 carat gold contains 75% by weight pure gold, but only 60% by volume. The guardians of the craft referred to were the Wardens of the London Goldsmiths' Guild. The first reference to a goldsmiths' guild operating in London is a Pipe Roll entry of 1179-80 when a "gild of Goldsmiths of which Ralph Flael is alderman" was fined 45 marks for operating without a licence. The statute of King Edward in 1300 authorised The Worshipful Company of Goldsmiths, usually known as the Goldsmiths' Company, to perform the "assay" of gold and silver, after the Norman French "assaie" which means "test", and to "touch" (mark with the leopard's head punch) assayed items. The company received its first royal charter in 1327, and its role continues today through the operations of The Goldsmiths' Company London Assay Office. Why Mark Silver but not Gold? Pewter candlestick and silver tazza courtesy of Shapiro & Co. The reason that all silver items were required to be marked when gold items were not was most likely to allow silver items to be distinguished easily and with certainty from items made of pewter, a tin based metal that can look very similar to silver when polished. The photograph here shows just how similar these two metals can appear. 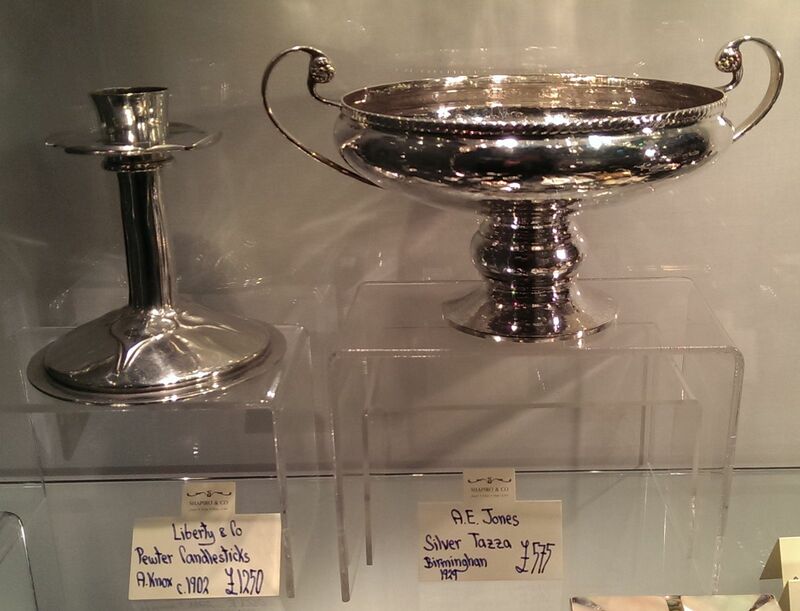 On the left is a pewter candlestick by Liberty & Co., on the right a silver tazza. The tazza in the picture is more highly polished than the candlestick and this can provide a clue to the metal, but it is not a guarantee because pewter will also take a high polish, although not as high as silver. You can see how similar the colours of the two metals are and how difficult it might be to tell whether an item was made from silver or pewter just be looking at it. I made the photograph at an antiques fair at Tatton Park in Cheshire by kind permission of the owners of the items, Shapiro & Co. of London. Silver has long been valued as a precious metal, whereas tin is a useful but relatively abundant metal that commands only a fraction of the price of silver. Silver was held by wealthy people as a store of wealth, and was made useful at the same time by being made into plates, tankards, candlesticks etc. Pewter items were much cheaper and pewter plates, tankards, etc. were the main items of tableware from the Middle Ages until they were replaced by cheap mass-produced glass, pottery and porcelain during the 18th and 19th centuries, so the two metals were used for similar items. Given the similar appearance of the two metals they could easily be confused if the silver was not hallmarked. In fact, pewterers took to stamping marks on their work that looked like hallmarks, which was a source of friction between the Pewterers' and Goldsmiths' Guilds. The first statute requiring silver to be hallmarked was the one in 1300 by King Edward, but there was no statutory requirement to mark gold until 1738. Perhaps it was felt that the possibility of confusion of gold with other metals was less likely to occur because gold wasn't widely used for tableware, and because of its unique appearance. However, silver gilt items (gold plated silver) would appear to be gold and were also stamped with the leopard's head standard mark, which must have been confusing, to say the least, so from 1816 an additional sun mark was struck on 22 carat gold. This was discontinued in 1844 when the the lion passant was replaced as the standard mark for gold. In the 16th century the Spanish Conquistadors in South America found large deposits of platinum in the Rio del Pinto. For its silvery colour they named it platina del pinto or "little silver of the river Pinto", from which is derived the name platinum. It is a silvery white metal, similar in appearance to silver although it does not tarnish. It was little used until the twentieth century, and until 1970 was on a restricted list from the 1939-1945 War so could not be used for consumer items, consequently UK hallmarks for platinum were only introduced in the 1973 Act, which came into effect in 1975. Platinum is extremely rare and, unlike gold, has industrial as well as decorative uses. Its price fluctuates depending on demand and can be similar to the price of gold, or more than twice as much. Standard mark - the guaranteed minimum fineness of the metal. Town mark - showing at which Assay Office the article was tested and hallmarked. Date letter - showing who was responsible for the assay, and thereby the hallmarking year in which the article was hallmarked. Sponsor's mark - the registered mark of the person under whose name an item was submitted to the Assay Office for testing and marking. Duty mark - showing that duty had been paid. Foreign mark - indicating an origin outside Britain. Although hallmarks are very interesting in their own right and can tell us a lot about the history of an item, the original reason for hallmarking and the item of principal interest to the original purchaser was the "fineness" of the metal, i.e. how much gold or silver is actually contained in the alloy. This is indicated by the "standard" mark. The standard mark does not show the actual gold or silver content, but shows that the proportion of gold or silver meets or exceeds a legally defined minimum standard. There are two standards for silver in Britain. Sterling silver, the most widely used, contains at least 11 ounces and 2 pennyweight of pure silver in the pound troy, making it at least 92.5% pure silver. The new standard of Britannia, introduced in 1697, contains at least 11 ounces and 10 pennyweight of pure silver in the pound troy, making it at least 95.8333...% pure silver, usually rounded to 95.84%. Gold purity is measured in carats, where 24 carat gold means pure gold and fineness is measured as a proportion of 24, e.g. 18 carats is 18/24 = 75% pure gold. It is important to note that these proportions are by weight. Because the density of gold is so much greater than other metals the proportions by volume are smaller. The first legal standard for gold in 1300 was 19&frac15; carats, which was reduced to 18 carats in 1477 and then raised to 22 carats in 1575, which remains the higher standard to this day. An additional lower standard of 18 carats was introduced at the request of watchmakers in 1798, and then in 1854, again at the request of watchmakers, additional standards of 15, 12 and 9 carat were allowed. The 15 and 12 carat standards did not prove popular and by Order in Council in 1932 they were both replaced by a standard of 14 carat. From the start of hallmarking in England in the year 1300 the standard mark struck on both silver and gold was the leopard's head. The early form of the leopard's head mark looks suspiciously like a lion, because this is in fact what it is. The Norman-French medieval heralds term for a lion shown passant guardant, i.e. walking and looking towards the viewer, was "leopart". This was stated in Norman French in the Act of Edward I in 1300 as une teste de leopart, which was translated into English as "the head of a leopard". In medieval English this mark was sometimes called the "Liberdes Hede" or "Liberd Heed", and sometimes, rather charmingly, the "Catte's Face". The leopard's head is therefore properly the head of a lion looking towards the viewer, i.e. simply a lion's face. However, it has always been called in English the leopard's head, and the representation has gradually morphed over the centuries to match its name so that it now truly looks like a leopard. Early versions had a full mane and until 1821 the leopard was pictured wearing a crown, since then he has been without the crown or mane. In 1544 during the reign of King Henry VIII an additional standard mark was introduced, the "lion passant guardant", a lion walking with three paws on the ground and right forepaw raised, his head turned over his shoulder to face the viewer. In some later versions of this mark the lion is shown looking straight ahead with his head in profile to the viewer. The origin of the lion passant mark is a mystery, it was not introduced by statute. It seems most likely that it was introduced when Henry VIII appointed by commission of the Lord Chancellor and Council two men, Matthew Dale and William Knight, to take charge of the London Assay Office as assay masters and touch makers. A struggle between the goldsmiths' and the King for control of the assay office ensued, and it appears likely that the lion passant was the standard mark applied under the direction of the King's assayers, but the leopard's head remained the standard mark applied by the goldsmiths' assayer, so both marks were struck on items marked at the London Assay Office. During the period 1697 to 1720 sterling was replaced as the standard for silver wares, but not for coins, by the higher Britannia standard, indicated by the marks of a lion's head "erased", a heraldic term meaning that the head has a jagged rather than a straight edge at the neck line, and the figure of Britannia. This was to stop coins being melted down and used as raw material for silver wares. There was a shortage of silver caused by wealthy families replacing silver wares that had been lost during the civil war. Due to an administrative blunder the Act omitted to authorise any assay office other than London to mark it. This left the provincial assay offices in limbo. Although it might have been argued that they were authorised to mark the leopard's head by ancient statute, the lion passant had been introduced in 1544 and there was no legislation to require or authorise its use by any office other than London. The 1697 Act made it quite clear that sterling was no longer a legal standard for plate and so the provincial assay offices of Chester, Exeter, Newcastle upon Tyne and York were prevented from assaying any silver until a new Act was "rushed" through in 1701, although Newcastle was omitted and had to be made the subject of a separate Act. These Acts authorised and required that the provincial offices strike the marks of the lions head erased and the figure of Britannia on silverwares of the new standard. When the sterling standard was reintroduced in 1720, all assay offices, London and provincial, were authorised to mark the leopard's head and lion passant on sterling silver as well as the lions head erased and figure of Britannia on silver of the higher fineness. The leopard's head was struck by the assay office of Chester with a crown until 1809 without until 1839, Exeter with a crown until 1778, York with a crown until the 1850s and Newcastle with a crown until its office closed in 1884. The reason why the provincial offices stopped striking the leopard's head alongside the lion passant is not known. The Birmingham and Sheffield Assay Offices, authorised in 1773, never struck the leopard's head mark. 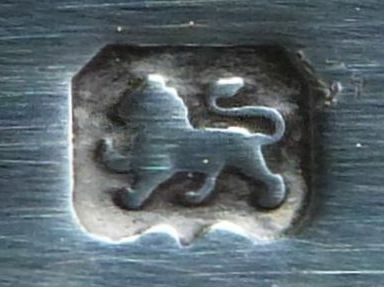 The lion passant became the most widely recognised hallmark symbol because it was used by all of the English assay offices. Although the town mark, the date letter and the sponsor's mark all varied from place to place depending on which assay office was used, the same lion passant was always present on "good English silver", and also for many years on gold. From 1544 to 1549 the lion struck by the London Assay Office was shown "passant guardant" and crowned. From 1550 to 1820 the London lion remained passant guardant, but without the crown. From 1822 the London lion passant was no longer shown guardant but instead with his head in profile, looking forward in the direction he is walking. Other English assay offices varied their depiction of the lion. At Birmingham he was passant guardant until 1875 and passant thereafter. At Chester he was passant guardant until 1822, passant from 1823 until 1883, and then passant guardant from 1884 again until the Chester Assay Office closed in 1962. The lion passant was the legal fineness mark used on all sterling silver in England until 1999, and was also used on 22 carat gold until 1844, but not for the additional lower 18 carat standard introduced in 1798 which was marked with a crown and the number 18. The use of the lion as the standard mark on both silver and gold meant that silver gilt items could possibly be mistaken for gold, so from 1816 an additional sun mark was struck on 22 carat gold. This was discontinued in 1844 when the the lion passant was replaced by the symbol of a crown and the number 22 as the standard mark for 22 carat gold. Since the year 2000 the legal standard mark for sterling silver is the .925 symbol, but the lion passant can still be struck as an additional mark - for an extra charge of course - and I make sure that this traditional mark is struck on my hand made sterling silver buckles. The standard mark for sterling silver used by the Edinburgh Assay Office was a Scottish thistle, Glasgow a lion rampant, and Dublin a harp crowned. At first the leopard's head mark was struck on silver items to show that they met the required standard and was therefore called the "standard mark". When the lion passant (see below) was introduced in 1544 to be struck alongside the standard mark, the mark of the leopard's head gradually changed its meaning to a "town mark", indicating that an item had been tested and marked in London. However, some caution is needed because the leopard's head was stamped on plate assayed at the offices at Bristol, Chester, Exeter, Norwich, York and Newcastle alongside their own town mark. London was unique in not having a separate town mark at the time. When Assay Offices were established in towns around the country they had their own distinctive town marks. The Birmingham office adopted a ship's anchor. 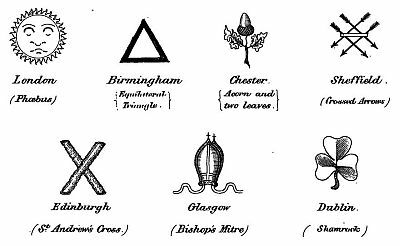 It might be thought strange that Birmingham, set in the middle of the country and about as far from the sea as you can get, would use an anchor for its symbol. This is said to go back to 1773 when silversmiths from Birmingham and Sheffield petitioned Parliament for their own assay offices so that they wouldn't have to send items to London to be marked. The petitioners held meetings in The Crown and Anchor public house off The Strand in London, and each town adopted one of these signs as its mark; Sheffield got the crown, and Birmingham the anchor. The mark of the Glasgow office was the arms of the city, a tree with a fish, a bird and a bell. In the early twentieth century, starting in 1904 for gold and silver wares and in 1907 for watches, the assay offices were instructed to stamp different town marks on imported items. In 1478 the Wardens of the Assay Office appointed the first permanent assayer. The Wardens had been made responsible for compensating anyone who suffered as a result of an incorrect assay result and naturally wanted to be able to identify who had performed the test, so a new mark called the "assayer's mark" was introduced. This took the form of a letter of the alphabet that was changed each year when new Wardens were elected. This is the origin of the "date letter" as it is now called, and explains why it wasn't changed on the first of January. At the time the Wardens were elected on 19 May, the Feast Day of Saint Dunstan, Dunstan was born at Glastonbury in about the year 925 and is the first recorded working goldsmith in England. He built a cell near the Abbey of Glastonbury containing a forge where he made censers and crosses, chalices and patens, as well as articles for domestic use. He successively became Abbot of Glastonbury, Bishop of Worcester, Bishop of London and Archbishop of Canterbury. After his death on 19 May 988 he was buried in Canterbury Cathedral, canonised in 1029, and became the patron saint of all good goldsmiths. The London Goldsmiths' Company especially honoured St. Dunstan, subscribing towards the light of St. Dunstan in the Church of St. John Zachary, keeping his day as a holiday, and designating him in their records as "Seynt Dunstan our blessed Patron, Protector and Founder". patron saint of English gold and silversmiths. New date letter punches were prepared for approval by the new wardens and the hallmarking year commenced. The term "hallmark" also originated in 1478 with this appointment of the first permanent assayer, when London craftsmen were first required to bring their work to Goldsmiths' Hall to be assayed and marked. William Herbert in "The history of the twelve great livery companies of London" vol 2 records that in 1550 the company changed the election day from the feast of St. Dunstan to that of the Holy Trinity. This must have been a slightly awkward choice of day because it is one the moveable feasts and falls on the Sunday following Pentecost each year so its date changes from year to year. Its earliest possible date is 17 May and latest possible date is 20 June. The reformation resulted in many saints being decanonized and perhaps as a result they were running short of suitable feast days in May. When Charles II was restored to the throne as King in May 1660 the date of changing the date letter punch was made the date that the King triumphantly re-entered London, which was also the King's birthday, 29th May. The actual date when the new letter was first struck was sometimes delayed by days, and even weeks, depending on when the new punches were accepted by the wardens, the letter "s" causing trouble on several occasions because the there is no distinct lower case version of the letter. The other assay offices around the country followed the pattern of London in changing their date letters when their new wardens were elected, usually on 1 July. Why was "j" left out? Well, the letter "j" was only invented in the 16th century, and didn't make its way into common English usage until the 17th century. The Goldsmith's Guild weren't going to change their ways for a new fangled thing like that. Even the hallmarking act of 1973, which did away with the London cycle ending in "u" and allowed the date letters to run up to " z", didn't introduce the letter "j" into London hallmarks - still a bit too modern I guess. To read a British hallmark date letter you must first identify at which assay office the item was hallmarked by identifying the assay office town mark. Then you must use a table of date letters appropriate for that office because the different assay offices all had different cycles of date letters stemming from when they were founded. For instance, London Assay Office cycles of date letters started in 1478, using 20 letter a to u excluding j which didn't exist at the time. The Birmingham Assay Office cycles of 25 or 26 date letters started when the Birmingham office was founded in 1773, nearly 300 years later. So it is no wonder that their date letter cycles are different. You also need to bear in mind that most published tables only show date letters for silver; date letters punched on gold were different. The first mention of this mark is in an Act of Edward III in 1363 which ordained that every master goldsmith shall have a mark by himself, and the same mark shall be known by them which shall be assigned by the King to survey their work and allay ... and after the assay made the surveyors shall set the King's mark, and after the goldsmith his mark, for which he will answer. The last part of this statement for which he will answer reveals the purpose of this mark, it is a responsibility mark. That is it identifies the person who would "answer" if the item was found to be fraudulently made or the gold or silver content was below standard. As the penalties at the time ranged from a hefty fine up to being nailed by the ears to the stocks, this was not something to be taken lightly. At first the mark could be any symbol, such as the sign of the goldsmith's shop, but in this was later changed to the initials of the first and last names of the registrant. The mark was not given a name in the 1363 Act and understandably but unfortunately became referred to as the "maker's mark". It was never the intention that the mark would identify who made an item, it was a legal identification mark and was purely concerned with identifying who took responsibility for the fineness of the gold or silver in the piece. Who actually made an item was of no concern to the assay offices, whose legal duty was restricted to confirming whether or not it was made of metal of the legal standard, and if it was below standard, punishing the person who was to ‘answer’, that is, the sponsor. The term ‘sponsor’ means, amongst other things, one who takes responsibility for something, and therefore ‘sponsor's mark’ accurately reflects the legal significance of this mark. A master goldsmith in the fourteenth century with a small workshop and a couple of apprentices and journeymen might naturally have been identified as the maker of an item. But as workshops got larger and skills became more specialised it became no longer possible to think in this way, and with developments in trade it became necessary to allow people such as retailers and importers to enter a mark so that they could send items for assay and hallmarking. This was first officially acknowledged in the 1738 Plate Offences Act, although it is obvious that the practice existed before 1738. It has therefore been misleading for about 300 years to call this mark a "maker's mark". The 1738/9 Plate Offences Act, section 21, required that ... after 28th of May, 1739, all and every person and persons who shall work or make, or cause to be wrought or made, any gold or silver vessel, plate or manufacture of gold or silver whatsoever, within that part of Great Britain called England, shall first enter his, her and their new marks, names, and places of abode, in the said assay office of the said company of goldsmiths ... Those who "cause items to be wrought or made" were clearly not the "workers or makers thereof", and that they are required to enter new marks implies that could have entered marks before this Act required them to enter new marks. Legislation in 1842 dealing with foreign plate contained no provision exempting such plate from liability to bear a maker's mark, though such mark can under the circumstances hardly ever be that of the real maker. The Gold and Silver Wares Act, 1844, introduced the term "private mark" as a result of such considerations. Since then the term "sponsor's mark" has been adopted and is the name for this mark in the 1973 Act. As an example consider the work of Paul de Lamerie, the most famous English silversmith of the eighteenth century. It is known that de Lamerie, in common with many other goldsmiths and silversmiths, often subcontracted work to a range of other workshops. He had the finished items marked with his registered mark before submitting them for assay and hallmarking. Although de Lamerie also had his own workshop in which some items were made, the presence of Paul de Lamerie's mark on an item of gold or silver does not show who made it, which might have been a subcontractor or workmen in de Lamerie's own workshop, and therefore it is clearly misleading to describe it as a "maker's mark". Even today and knowing the truth full well, the term "maker's mark" is often casually used by people at the assay offices, but the acid test is to ask them if they will guarantee that the registered person actually made the item, and then they will explain that that is not the purpose of the mark. In 1784 duties were made payable on all gold and silver plate, and the sovereign's head was impressed as a fifth hallmark, to show that duty had been paid. Watch cases manufactured in the UK were made exempt from duty in 1798 (24 George III c. 64, s. 5 "An Act to repeal the duties on gold and silver plate used in watch cases.") to enable English watch manufacturers to better compete with foreign made products. The duty on all gold and silver plate was abolished in 1890, and consequently the sovereign's head ceased to be impressed on assayed articles. The duty mark shown in tables of hallmarks in Bradbury and other standard references was stamped on watch cases between 1784 and 1798. It continued to be impressed on gold and silver items up to 1890 but is not found on watch cases after 1798. To answer concerns that items of foreign manufacture with UK hallmarks could be thought to have been made in the UK, a requirement was introduced for an additional mark, a letter "F" in an oval shield signifying Foreign manufacture, to be stamped alongside the usual hallmarks on all foreign made silver and gold items. This requirement was first introduced in 1867 in the Customs Amendment Act (30 & 31 Vict. c. 82 s. 24). That statute was later repealed by the Customs Consolidation Act, 1876 (39 &40 Vict. c. 36); but the requirement was re-enacted in the same words by the Customs (Tariff) Act 1876 (39 & 40 Vict. c. 35). The "old standard" for silver in Britain is sterling, which dates back to at least 1238 and probably much earlier, possibly to even before the Norman conquest and into Saxon times. The origin of the name sterling is uncertain, but does not relate to the Scottish town of Stirling. The Oxford English Dictionary says that he most plausible explanation is that it was descriptive of Norman penny introduced after the conquest, deriving from late Old English "steorling" meaning "a coin with a star" (steorra = star), some of the early Norman silver pennies having on them a small star, but this version has fallen out of favour. Nick Mayhew summarised the current ideas in Sterling: the rise and fall of a currency and favours the explanation that a stabilisation of the coinage after the Norman conquest resulted in silver coins being called "sterling" from "ster" meaning strong or stout, derived from the ancient Greek στερεός [stereos] meaning solid. Interestingly, the foundation piers that the old London bridge stood upon were called "sterlings". The standard of sterling was eleven ounces and two pennyweight, or 11oz 2dwt, in the pound troy, the rest being a base metal alloying element, usually copper, which makes the resulting alloy stronger and more durable than pure silver. One pennyweight was the weight of a medieval penny and is one twentieth of a troy ounce, of which there are 12 in a troy pound. So the amount of silver in sterling silver is 11 and two twentieths troy ounces in 12 troy ounces, or 11.1/12 = 0.925, that is 92.5%. To prevent silver coins being melted down to make silver wares, which had been increasing due to demand from wealthy households to replace silver wares that had been used for coin or cut up into tokens of exchange during the civil war, an Act 8 and 9 William III c. 8 s. 9 was introduced in England in 1697, coming into effect on Lady Day 25 March new year's day 1698, a "new" standard or Britannia standard for wrought plate. The fineness was set at eleven ounces and ten pennyweight, or 11oz 10dwt, in the pound troy; 0.9583 or 95.83 per cent silver. The standard mark was the figure of Britannia, and the leopard's head of the London Assay Office was replaced by a lions head "erased" (erased meaning a rough edge rather than a straight line at the neck). Silversmiths were required to register a new sponsor's mark, being the first two letters of their surname. If you took 10lbs of sterling coin you would have 9.25lbs of pure silver and 0.75lbs of copper. To make this into new standard Britannia silver you would need to add 8lbs of pure silver. The mix would then weigh 18lbs, containing 17.25lbs of pure silver and the original 0.75lbs of copper. The purity would be 17.25/18 = 0.9583, which is Britannia. The idea was that this would make it difficult to use melted coins, which remained at the lower sterling standard, because additional pure silver would have to added to the melted coins to bring the purity up from 0.925 to 0.958. The amount of additional pure silver was considerable: for every 10lbs of sterling coin melted, an additional 8lbs of pure silver would have to be added to bring the purity of the metal up to the new standard. As the reason that coin was being melted was that silver was in short supply, this in effect made it impossible for silversmiths to obtain supplies of the new standard silver from coin. Britannia silver is considerably softer than sterling and after complaints from the trade the sterling standard for plate was reinstated in 1720. The Britannia standard gave particular problems to watch case makers where the snap fastening of the opening lids of cases would wear quickly. Britannia standard continued as a legal standard together with sterling, and is still a legal standard today, but now after over 300 years it is only rarely referred to as the "new standard". Before the eighteenth century the situation with regard to hallmarking watch cases does not appear to be as clear cut as for larger items of gold and silver ware. A watch case was regarded by watchmakers as an adjunct to the expensive watch works and they didn't seem to feel that the trouble and cost of getting it hallmarked was necessary. The Goldsmiths' Company didn't agree with this forced gold case makers to have a full set of 22-carat London marks as early as 1683/4, and threatened to sue Daniel Delander if he did not conform. Others, but not all, followed suit. The situation regarding silver is more complicated. Philip Priestly says that the earliest known silver example is a Britannia silver pair case by Richard Blundell fully London hallmarked for 1698/9 containing a watch by Joseph Banks of Nottingham, and that there are no fully hallmarked sterling silver cases until after the sterling standard was reintroduced in 1720. Hallmarking of Gold and the privilege of the "assay and touch"
The statute of King Edward did not require gold items to be routinely tested and marked. The Wardens were given powers to enter the premises of any goldsmith or silversmith and test items to make sure that they were up to the standard, but there was no statutory requirement for gold items to be hallmarked. From early days the Goldsmith's Company took the view that gold items were not precluded from being hallmarked, and if items were sent to Goldsmiths' Hall for assay they would be hallmarked as for silver items, at first with the leopard's head, later with the walking lion. The Wardens of the Goldsmith's Company gradually extended the guild rules on hallmarking to all gold items, and as goldsmiths had to be members of the Goldsmiths' Guild, it could impose any rules it chose onto its members although not all complied willingly. The Act that introduced the Britannia standard for silver, William III, 1696-7: "An Act for Incouraging the bringing in wrought Plate to be coined" also had far reaching consequences for hallmarking. Earlier Acts had been less than definitive about who was to have their works hallmarked, and exemptions for small items. Goldsmiths' Hall had previously interpreted the law to mean that only goldsmiths, i.e. members of the London Guild of Goldsmiths, were entitled to the "assay and touch", which created a closed shop because without a hallmark it was illegal to sell silver wares. The 1697 Act changed this by making it clear that ... no Goldsmith Silversmith or other Person whatsoever shall work or make or cause to be wrought or made any Silver Vessell Plate or Manufacture of Silver lesse in Fineness than that of Eleven Ounces and Ten penny Weight of fine Silver in every Pound Troy nor putt to sale exchange or sell any Silver Vessells Plate or Manufacture of Silver ... (unlesse it be Silver Wyre or such things as in respect of their smallnesse are not capable of receiving a Mark) until such time as such Vessell Plate or manufactured Silver shall be marked .... The definition of items exempt from marking, silver wire or items too small to bear the hallmarks, was the first time that this had been spelled out in such detail. It took some time before the full implications of this clause were understood by Goldsmiths' Hall, but after taking legal counsel it became clear that as a result of the Act they were obliged to assay and hallmark items submitted by any persons, whether guild member or not, and whether they resided in London or elsewhere. This opened up new sources of revenue to Goldsmiths' Hall, which was very short of funds at the time, but brought protests from London goldsmiths that their cosy monopoly of the trade was being ended. The Goldsmiths' Company were however adamant that the law was unequivocal. In 1717 a notice was issued by Goldsmiths' Hall to all goldsmiths, silversmiths and plateworkers, including foreigners, stating that they must bring all their works to the Assay Office to be assayed and marked, and that All such works of gold and silver which are not so assayed and marked are liable to be seized and forfeited ... This notice effectively extended the privilege of the "assay and touch" to workers who were not members of a London guild, breaking the centuries old monopoly that guild members had over working silver and gold. Until this notice was issued the right to the "assay and touch" was a privilege of members of the Goldsmiths' Guild and freemen of other guilds. If someone who was not a member of a guild wanted to get an item hallmarked he had to ask a member of a guild to submit the item under his own maker's mark, a process known as "colouring" which the wardens regarded as a greater offence than using substandard silver. The 1717 notice by the Goldsmiths' Company was the first time that it had been stated unequivocally that all gold items had to be hallmarked, which was still not supported by any statute. It was not until the 1738 Act "An Act for the better preventing Frauds and Abuses in Gold and Silver Wares" (12 Geo. II. c. 26), usually called the Plate (Offences) Act, that gold items were first required by statute to be hallmarked. The 1738 Act also extended the statutory right to register a mark for the purposes of hallmarking to persons who were not members of the goldsmiths' guild. 5. From and after the said 28th day of May, 1739, no goldsmith, silversmith, or other person whatsoever, making or selling, trading or dealing in gold or silver wares, shall sell, exchange or expose to sale within that part of Great Britain called England, any gold or silver vessel, plate, or manufacture of gold or silver whatsoever, made after the said 28th May, 1739, or export the same out of this kingdom, until such time as such vessel, plate or manufacture of GOLD (being of the standard of 22 carracts of fine gold per pound troy), and such vessel, plate, or manufacture of SILVER (being of the standard of 11 oz. 2 dwt. of fine silver per pound troy) shall be marked as followeth ; that is to say, with the mark of the worker or maker thereof, which shall be the first letters of his Christian and surname, and with these marks of the said company of goldsmiths in London, viz., the LEOPARD'S HEAD, the LION PASSANT, and a distinct variable mark or letter to denote the year in which such plate was made; ... with subsequent similar clauses for the provincial assay offices. These three sections of the Act require for the first time that, in addition to silver items, all gold items were to be hallmarked. It also recognised the any person who ... shall work or make, or cause to be wrought or made, had to enter their marks at the assay office, not just the "makers" as previous Acts had specified. And the phrase ... shall first enter his, her and their new marks ... is interesting, because the implication is that such persons may have entered marks at an earlier date, which were now their "old" marks. Certainly by the time of this Act in 1738 the term "maker's mark" had lost its intrinsic meaning. Although it would appear that the 1738 Act implicitly covered imported gold or silver items that were sold, exchanged or exposed to sale, the Customs Act of 1842 (5 & 6 Vict. c. 47 s. 59) made it explicitly illegal to sell imported gold or silver items in the United Kingdom unless they had been assayed at a British office and stamped with the usual British hallmarks. To be hallmarked meant that the imported items had to meet the UK assay standards of 22 or 18 carat for gold, and Sterling for silver. Why this either explicit statement or extension of the 1738 law was felt to be necessary is not clear from the Act, but in "Hallmark: A History of the London Assay Office" John Forbes says that the 1842 requirement was brought about as a result of the Manufacturing Silversmiths' Society expressing to the London Assay Office concerns that an anticipated reduction in import duties on gold and silver items would result in a flood of inferior foreign products entering the country, "there being no provision in law for hallmarking imported items". This statement is contradicted by evidence given in 1878 to a Select Committee by Walter Prideaux, Clerk to the Goldsmiths' Company, who said that he thought that under the 1738 Act foreign watch cases should be hallmarked, and that he couldn't think of any reasons why they should not be marked. If that was true for foreign watch cases, which Mr Prideaux was being specifically asked about, then it must have been equally true for foreign plate of any description. However, it is evident that prior to 1842 British hallmarking was restricted by custom and practice to items made in the UK. This idea was taken up and amplified by the economist David Ricardo (1772-1823 ) who opposed the protectionist Corn Laws, which restricted imports of wheat and argued for free trade. His ideas strongly influenced Robert Peel, leading to Peel's great 'free-trade' budgets of 1842 and 1845 and, as British Prime Minister, the repeal of the corn laws in 1846, although this was opposed by most members of his own party and resulted in his resignation. One effect of the 1842 act was that it implicitly conferred on importers of gold and silver items the right to enter their mark at an assay office so that they could send items for assay. This was recognised in the "Gold and Silver Wares" Act of 1844 (7 & 8 Vict., c.22) when the term "maker's mark" was changed by section 8 to "private mark", which the Act allowed could be registered by any worker, maker and manufacturer of, or trader or dealer in, gold or silver wares. Today the assay offices use the term "Sponsor's mark", rather than "private mark". In 1878 following complaints from Coventry watchmakers that foreign watch cases were being marked with British hallmarks, Sir Henry Jackson (1831 - 1881) the member of Parliament for Coventry proposed a draft bill to prevent any watch case not manufactured in the UK from being hallmarked. A Select Committee of the House of Commons was set up to look into the hallmarking of foreign items. One of the specific areas the committee looked into was the British hallmarking of foreign watches. One of the witnesses to give evidence was Walter Prideaux, Clerk of the Goldsmiths' Company. In his evidence concerning imported gold and silver watches Mr Prideaux said "Foreign watches in unmarked cases have been always, I am informed, sold in England without challenge", a rather surprising statement for the person who was largely responsible for adjudicating day to day when questions arose about what items should or shouldn't be hallmarked. Mr Prideaux went on to say that he thought that under the 1738 Act foreign watch cases should be hallmarked and he couldn't think of any reasons why they shouldn't. Mr Prideaux later said by way of explanation "What I say is this : that we have never been asked to sue for penalties. No man has ever come and given information, and said, " Here is a foreign watch case which I saw being sold, and I ask you to sue." The thing has never been done. The practice has existed from time immemorial; in point of fact, before the time of [the 1738 Act] 12 Geo. 2 ; and I certainly, in my position as legal adviser of the company, could not advise them to sue under those circumstances; but then I should find it difficult to give a reason for not doing it." Mr Prideaux first noticed in around 1874 that significant quantities of foreign made watch cases were being sent to Goldsmiths' Hall for hallmarking, and that the assay officers could easily recognise these foreign watch cases so he asked them to record the numbers. At first they were only about 1,500 out of 150, 000 cases marked in the year and he thought that it was such a small matter that no action was needed, but the number had subsequently grown rapidly. In the hallmarking year ending 28 May 1878 the totals of watch cases marked were 101,017 silver and 30,161 gold, of which 10,440 silver and 2,110 gold cases were foreign. Foreign watch cases were 10.3% of the total number of silver cases marked, and 7% of the gold cases. These watch cases were being marked with British hallmarks, but not with the foreign F as required by the 1867/1876 law. Mr Prideaux noted that Goldsmiths' Hall had no power of inquiring into the origin of things and that if a registered dealer sent items in with his private registered mark upon it, Goldsmiths' Hall were bound to assay them and mark them without any power of inquiring where they were made. Mr Prideaux also said that if the laws were to be implemented as intended then it was absolutely necessary that the Customs not be allowed to part with imported goods unless they had been hallmarked. James Walker, a watch case maker from Coventry, stated that the practice of hall marking foreign watch cases had been growing for the last three or four years. Walker said that it had been done for 10 years past, but to a very limited extent compared to the dimensions which it has assumed by 1878. Evidence was presented to the committee of the number of watch cases marked at Chester. Before 1876 all were English made, and in 1875 they hall marked 25,778 English made silver watch cases. In 1876 they hall marked 34,846 watch cases, of which 10,224 were foreign made, and in 1877 they hall marked 45,355 watch cases, of which 20,704 were foreign made. The quantity of English manufactured watch cases marked at Chester over the three years had remained virtually static at 25,778, 24,622 and 24,651 whereas the number of foreign cases had increased markedly. Although it is not mentioned whether these cases were marked with the additional F hallmark signifying foreign manufacture, it seems likely that they were not and that the Chester Assay Office, like the London Assay Office at Goldsmiths' Hall were recording the numbers of foreign but powerless to require them to be submitted for assay as foreign. The chief complaint against the operation of the existing law comes from the manufacturers of watches and watch-case. They have established by evidence that within the last few years a practice has sprung up, and is rapidly increasing, under which foreign-made watch-cases are sent to this country to be Hall-marked with the British Hall-mark, and are afterwards fitted with foreign movements, and are not then unfrequently sold and dealt in as British made watches; and they assert that this not only injures their own reputation and lowers the credit of British workmanship, but is contrary to the spirit and intention of our legislation. The Assay Offices are unable legally to refuse to Hall-mark these foreign watch-cases when brought for assay by registered dealers, though their officials are practically able to distinguish them from cases of British manufacture. That Parliament has recognised the distinction between foreign and British plate is shown by the provisions of an Act 30 & 31 Vict. c. 82, s. 24 [the 1867 Customs Amendment Act], which requires all imported plate to be marked before sale with the letter F in an oval escutcheon, "in order to denote that such gold or silver plate was imported from foreign parts, and was not wrought or made in England, Scotland, or Ireland." Until the practice of Hall-marking foreign watch-cases sprang up, the British Hall-marks were taken to indicate British workmanship, and your Committee cannot doubt that foreign watches in watch-cases so Hall-marked are frequently sold as of British manufacture. The Committee are therefore of opinion that all foreign-made watch-cases assayed in this country ought to be impressed with an additional distinctive mark (the letter F, by reason of its resemblance to existing marks, is not sufficiently distinctive) indicative of foreign manufacture, and that the law ought to be altered accordingly. The committee felt that the letter "F" was not sufficiently distinctive because the public was used to looking for the standard mark of the lion passant on UK made items. There were always other marks in addition to the lion, such as the maker's mark, and the public not being expert in matters of hallmarking were quite likely to assume that the letter "F" was one of these marks. Seeing the lion on a watch case they were likely to assume that the whole watch was made in the UK. They were also concerned that the letter F was too easy to remove. One of the witnesses who gave evidence to the committee in 1878, James Walker a watch case maker from Coventry showed them several watch cases that had been hallmarked at Goldsmiths' Hall that morning and which by the time he showed them to the committee in the afternoon some of the marks had been removed so that there was no trace of them although the other hallmarks were still clearly visible. The suggestion of Walter Prideaux regarding the Customs Authorities, that they not release gold or silver items until they had been hallmarked, and the Committee's recommendations were not acted upon immediately, but the Revenue Act of 1883 (46 & 47 Vict. c. 55 s. 10) required that all gold and silver plate imported into Great Britain or Ireland be deposited in a bonded warehouse and not released from bond until it had been hallmarked. The marks remained the usual UK hallmarks and the letter "F". When I consulted The Goldsmiths' Company about the use of the "F" mark from when it was first required in 1842 they told me that there was considerable difficulty in enforcing the 1867 act, to the extent that hardly any items of silver are known to bear the "F" mark until the early 1880s. The appearance in the 1880s (presumably starting in 1883) of silver items marked with the letter "F" shows that this requirement of the 1883 Act had an immediate effect on imported gold and silver items in general, but imported watches with British hallmarks and the "F" mark are virtually unknown, so the law was evidently still not effective in their regard. The principal thing that the English watchmakers and watchcase makers were complaining about was that foreign manufactured watch cases were being imported and sent to British assay offices to be marked with British hallmarks, and then returned abroad to have the watch movement fitted. These entirely foreign made watches were then imported carrying British hallmarks, and it was said that the hallmark misled British people into thinking that the whole watch, case and movement, was made in the UK. The introduction of the "F" mark to combat this was deemed a failure because it was insufficiently distinct from either the sponsor's (maker's) mark or the official date letter, and it was also easy for agents of foreign manufacturers to avoid the "F" by submitting items for assay without declaring that they were foreign. These concerns were finally addressed in the 1887 Merchandise Marks Act (50 & 51 Vict. c. 28). The Act required that a statutory declaration of the country of origin be made for all watch cases submitted for assay, and that the hallmarks stamped on foreign made watch cases be completely different to the normal UK hallmarks. Note that this Act was specific to watch cases only, it did not apply to other imported items of gold or silver. An Order in Council implementing the requirements of the Act came into force on 1 January 1888. New town marks shown in the first part of the figure here were introduced for the assay offices to stamp on foreign made watch cases. 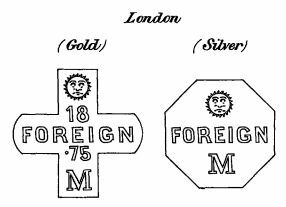 For example, the London Assay Office mark of the leopard's head mark was replaced on imported items by a radiant sun's head in a square shield for gold, or oval shield for silver. The standard marks were also changed so that could not be mistaken for UK hallmarks; the crown mark of gold and the lion passant of sterling silver were replaced with plain numbers, e.g. .925 for sterling silver. The Order in Council also introduced a new and completely different style of composite hallmarks as shown in the second part of the figure to be used for foreign manufactured watch cases, with the word "Foreign" prominent in the centre. The idea was to make it impossible to obliterate or remove the word foreign without this alteration being obvious. The effect of these new hallmarks, very different from the normal UK marks and with the prominent word "Foreign" in the middle, was to stop immediately foreign manufactured watch cases being sent for British hallmarking, as effectively as if the wording had been "Foreign muck" - which is probably what it was intended to imply! The foreign marks would not have been applied to British made watch cases, so it would have been possible (although it would not have made economic sense) for foreign manufacturers to use genuine English made cases with the usual British marks, but the Act anticipated this and also required a clear statement of where the "works" was made. The upshot of the 1887 Act was that no foreign watches received British hallmarks of either sort, the usual British hallmarks or the foreign ones, and the English manufacturers were happy. I have never seen a watch marked with the British "foreign" hallmarks, but there is some evidence that a few were. Evidence presented to the House of Commons (discussed in the next section) indicates that three watches were marked between 1902 and 1903 on declaration that they were foreign, and in "Marks on Gold & Silver Plate" by William Redman, 1907, Redman says that the 1887 act was "almost a dead letter" and that he had only seen three watch cases marked as required by the act in the twenty years that it was in force. Whether he was referring to the three cases already mentioned or had actually seen three cases, those three or another three, is unknown. MR. CHARLES MURRAY (Coventry) To ask the President of the Board of Trade whether he can inform the House of the number of gold and silver watch cases marked by each of the Assay Offices in the years 1902 and 1903, on declarations that such cases were made outside the United Kingdom. (Answered by Mr. Gerald Balfour.) The Assay Offices have been good enough to supply the information desired by my hon. friend, and it appears that in London one gold watch-case was marked in 1902, and one gold and one silver case in 1903, on declarations that they were made outside the United Kingdom. No watch-cases were marked under similar circumstances at any of the other Assay Offices in either year. Three watches in two years! This must have caused some puzzlement, and then there was a bombshell when it was revealed that the Customs authorities didn't treat imported watches in gold or silver cases as "plate" and had therefore not been ensuring that they were sent for assay, and that the Goldsmiths' Company was aware of this and hadn't challenged it. In 1904 the Board of Customs consulted the law officers of the Crown, who were of the opinion that the cases of watches imported complete should be hallmarked. However, the Board Customs had long treated imported watches as not requiring to be hallmarked and so were reluctant to change their practice without a some more formal decision, so they asked the Goldsmiths' Company to take out a test prosecution. The Company agreed and looked for a likely candidate to prosecute. They didn't have to search far: one William Wyatt had "form" as far as the Company was concerned. In 1897 Wyatt had been found guilty of fraudulently transposing hallmarks (cutting them from a legitimate item and soldering them onto another item of lower fineness) and sentenced to 14 months' imprisonment with hard labour. So, on the 14th day of March 1905, Sir Walter Sherburne Prideaux, Clerk of the Goldsmiths' Company, went calling on William Wyatt and purchased four watches, two in silver cases and two in gold cases. None were hallmarked, so the Goldsmiths' Company took out a prosecution under the 1842 act. The judgment by Mr. Justice Channell in the initial trial of Goldsmiths' Company v Wyatt went against the Company on the grounds that watches were not "plate", but this was reversed in the Court of Appeal before Lord Justice Collins, Master of the Rolls, and Lords Justice Cozens-Hardy and Farwell in November 1906. Lord Justice Sir George Farwell, in presenting the judgment of the Court, identified two different uses of the term "plate" and concluded that watch cases clearly were "plate" within the meaning of section 59 of the 1842 Act. Empty watch cases had in fact been treated as plate by the customs, and the appeal judges found that it could not be contended that the insertion of works into a watch case could make the watch case no longer plate. He also pointed out that a schedule the customs had relied on when distinguishing between watch cases as "plate" and complete watches as "not plate" was concerned only with taxation, and this schedule did not change the requirement of section 59 of the 1842 Act that required all foreign plate to be hallmarked. In his concluding remarks Lord Justice Farwell addressed the comment that no one would use the term "plate" as including gold and silver watches in common parlance, pointing out that the proper question was not whether gold and silver watches would be described as plate in ordinary language, but whether they were described as such in Acts of Parliament, where the Court found that they clearly were. Lord Justice Farwell concluded that watch cases were "plate" within the meaning of section 59 of the 1842 Act, and therefore should be assayed and marked as required by the law. The case of Goldsmiths v. Wyatt revealed starkly that British law since 1842, and probably since 1738 or even earlier although that question was not addressed, required that gold and silver watch cases should be assayed and hallmarked in a British assay office, and that there were no exceptions for foreign manufactured watch cases, and that this had not been taking place due to a misunderstanding by the Customs authorities with the supine awareness of Goldsmiths' Hall. The origin of the confusion revolves around the use of the term "plate" in the 1842 Act. Plate is used by the assay offices, and hence in Acts of Parliament about assay and hallmarking, in two distinct ways, (1) in the ordinary way, to mean platters or shallow dishes, and (2) in a particular way as a genus, stemming from the origin of the word in the Spanish "plata" for silver, which became extended to include gold, and which includes as species vessel, dish, cup, bowl and every other form of gold or silver ware, and this specialised definition includes items that would not ordinarily be called plate by anyone outside the assay office. Unfortunately, in this case, "anyone outside the assay office" included the customs authorities. They were primarily concerned with levying customs duties, not with hallmarking, and naturally turned to the schedules at the back of the Act containing lists of articles on which duty was to be imposed and the amounts of the duty to be charged. In this schedule "Plate of Gold" and "Plate of Silver" appear in Class VI, and "Watches of Gold or Silver, or other Metal" appear in Class XIX. This difference lead the customs authorities to treat empty gold and silver watch cases as "plate", because they were clearly not watches, but complete watches as "not plate", because watches were in a different Class. Such confusion often occurs when the arcane language, often jealously preserved, of one profession is encountered by someone outside that profession. In 1900 British manufacturers of gold and silver items started to demand of the government the same protection from foreign competition as was given to British watchcase makers. On 28 June 1900 a deputation from the Birmingham Jewellers and Silversmiths' Association, and members of the Goldsmiths and Silversmiths' Trade in London and Sheffield, was received at the Board of Trade in London. Speaking for the deputation, Mr. E. T. Pendleton (Birmingham) said that the British hallmark was looked upon by general public as a sign of British workmanship, and that the letter "F" that was applied to foreign manufactured items was inadequate because it was could easily be confused with the initials of the firm making the goods, or with the official date mark. The deputation therefore suggested the desirability of hallmarking foreign plate and jewellery with the distinctive Assay marks that were ordered to be used on foreign manufactured watch cases by the Merchandise Marks Act of 1887 and which had effectually stopped unfair competition in the sale of foreign watches in Britain. The Board of Trade was not initially sympathetic, but in 1904 the "Hall-Marking of Foreign Plate Act" and Order in Council complied with the request. The Act specified that a hallmarks different from the usual UK hallmarks were to be struck on "any plate or article imported from foreign parts" and the Order in Council specified that from 31 October 1904 the same town marks were to be used on imported items as had been defined in 1887 for hallmarking imported watch cases (e.g., the sign of Phoebus for London). The combination mark specified in the 1887 legislation, with all of the individual marks together with the word "Foreign" contained within a single shield, was not required; the word "Foreign" was omitted, and the marks were to be struck separately in the same way as traditional British hallmarks. Numerical values were specified for the fineness mark so that the crown for gold and the lion of sterling silver would not be used on foreign plate. For gold the carat value together with its decimal equivalent was marked, for silver items the decimal equivalent of the standard was marked. E.g. 18 carat gold was to be marked 18 and .75, sterling silver was to be marked .925. Some of the 1904 marks for imported items were soon found to resemble existing trademarks, so in 1906 new marks for imported items were defined by Order in Council for the London, Sheffield, Glasgow, and Dublin assay offices; the marks for Birmingham, Chester, and Edinburgh remaining the same as before. The London Assay Office mark became the sign of the constellation Leo, which looks like an omega symbol, on a cross in an oval shield for silver and square for gold. The Glasgow Office mark became two opposed block letters "F" prone. The Birmingham Office symbol became an equilateral triangle. The 1904 Act and consequent Order in Council, and the 1906 Order in Council that altered the town marks, did not alter or repeal the sections of the 1887 Merchandise Marks Act that applied to watchcases, or the Order in Council that defined the hallmarks that were to be applied to foreign manufactured watchcases from 1 January 1888. This meant that watchcases were still by law required to be marked in accordance with the 1887 Order in Council, including the composite marks with the word "Foreign" across the middle and with the town marks that had been found to be problematic when used on imported plate after the 1904 Order in Council came into force. The fact that these discrepancies were not noticed probably simply shows that no foreign watchcases were being sent for hallmarking at the time. The judgment of 1906 caused great concern to retailers who had stocks of watches that they thought had been imported correctly, after all, the Customs authorities had permitted it, so a bill the "Assay of Imported Watch-Cases (Existing Stocks Exemption)"" Act 1907 was passed to exempt all watch cases imported into the UK before 1 June 1907 from the requirement, made law by Act of Parliament in 1842 some 65 years previously, from being hallmarked. "My Lords, the necessity for this Bill has been brought about in a rather curious way. According to the Customs Act, 1842, all foreign plate imported into this country must be of the same standard as our own plate and must be hall-marked. For some reason the customs authorities have always considered that watch cases did not come within the meaning of the Act, and consequently up to the present time they have always been exempted from assay and marking. The result is that watch cases of all kinds have been brought into this country, and cases have been sold as gold and silver which were nothing of the sort. The Court of Appeal the other day ruled that watch cases were plate within the meaning of the Act, and the object of this Bill is to exempt from assay and hall-marking all watch cases which are at present in stock over here and which came into this country before 1st June last." The Act received Royal Assent on 2 August 1907. You will note that the passage of the Act through parliament and its assent into law in August was actually after the date of 1 June specified in the Act as being the effective date. This was not retrospective legislation, the law requiring all imported watches to be hallmarked already existed, as had been shown by the case of Goldsmiths vs. Wyatt. The effect of the new Act was to exempt from being retrospectively hallmarked all the thousands of watches that had been imported without hallmarks before June 1907. "All Gold and Silver Watch Cases imported into this country on and after June 1st next will be dealt with by the Customs as Plate within the meaning of Section 10 of the Revenue Act, 1883, which provides that Gold and Silver Plate shall not be delivered for home use until assayed, stamped, and marked according to law." The result of all this muddle is that from 1842 large numbers of complete Swiss watches in gold and silver cases were imported without being hallmarked as the law required, and that the exceptions in small numbers that did get hallmarked were ones the Swiss manufacturers wished to pass off as British! An astonishing state of affairs given the large numbers of Swiss watches entering the country in the second half of the nineteenth century. In "Marks on Gold & Silver Plate" by William Redman, 1907, Redman says that the 1887 act was "almost a dead letter" and that he had only seen three watch cases marked as required by the act in the twenty years that it was in force. Foreign watch manufacturers and importers were naturally concerned that the watchcases they were now required to submit for hallmarking would be marked with the large and offensive marks defined in 1887. On 23 January 1907 a report in The Times said that the Board of Trade had received representations that it would be difficult to place these marks on watchcases of small size or delicate manufacture. It was suggested that the simpler marks prescribed for foreign plate by the Order in Council of 11 May 1906 could be placed even on small watchcases and this suggestion was adopted by a new Order in Council issued in May 1907, effective on 14 May. This Order essentially repeated the requirements of the 1906 Order in Council that applied to imported items that were not watch cases, but this time with specific application to watchcases, repealing the 1887 Order in Council. I wonder what bright spark noticed in 1907 that the 1887 Order in Council was still in force for watch cases? It was probably someone at Goldsmiths' Hall who, on learning of the outcome of Goldsmiths' v. Wyatt, thought that he had better look out some punches to be used for the expected flood of foreign watch cases! Because the assay and hallmarking of foreign watches came after the 1904 marks for imported items had been found to resemble existing trademarks and new town marks for the London, Sheffield, Glasgow, and Dublin assay offices for imported items were defined, the 1904 marks were never used on watch cases. Before 1 June 1907 there were several methods by which Swiss and American watches reached British retailers. A representative working in Britain would visit retailers around the country, showing them samples and taking orders. This person might be from a British branch of a manufacturer, either employed directly by the manufacturer or working on commission, or an independent person working on their own account. Orders would be fulfilled either from stocks already held in Britain, or by the factory sending watches to Britain, which might be sent directly to the retailer, or to the representative who would pass them on the to the retailer. All imported watches had to pass through British customs at the port of entry, where they were checked for legality and the import duty was levied, which had to be paid before the good would be released by the customs authorities. Sometimes the supplier paid this and then added it to the customer's invoice, for smaller orders the retailer would make the payment and take away the goods. But however the orders were taken and fulfilled, Swiss watches usually came into Britain from the Swiss manufacturers complete; cased, timed and ready to be retailed. Some Swiss manufacturers had UK based branch offices or agents that were large and long standing, such as Dimier Brothers, Baume and Company, and Stauffer & Co. These had premises where they could store stock ready to be sent out in response to orders. Others such as Castelberg, Pettitpierre and Co. were one man, or in this case two man, bands working out of offices in London with no storage or workshop facilities. In the 1870s some foreign manufacturers began having foreign watch cases hallmarked in British assay offices. Waltham imported Swiss cases that were hallmarked and then used to house American made Waltham movements. Some Swiss manufacturers sent empty cases to be hallmarked and then returned them to Switzerland to be finished into watches. The British watch manufacturers objected to this, and the practice of having foreign watch cases marked with the usual British hallmarks was stopped by the 1887 Merchandise Marks Act, which required that any foreign watch cases hallmarked in Britain should be marked "Foreign". This effectively stopped the practice and between 1 January 1888 and 1 June 1907 no foreign watch cases were hallmarked in Britain - there might have been a few, perhaps two or three that have never been seen since, but this was negligible compared to the hundreds of thousands of watches that were imported. After 1 June 1907 the requirement for all imported watches to be hallmarked in the UK added an extra complication. Some large manufacturers found that it was practical to bring in the bare cases, get them hallmarked and then return them abroad to be finished into watches. In other cases watches were imported already complete, the movements removed, the cases hallmarked and then the watch reassembled in England. This meant that someone had to remove the movement from the case and stamp the case with a registered sponsor's mark. The details of the sponsor, the person who took responsibility for the standard of the case, must have been registered with the assay office beforehand, and the details of the punch that was used to make the mark recorded. The watch case could then be sent to the assay office, where it would be assayed and hallmarked, and then returned to be reunited with its movement. Obviously this required a workshop and premises where the movements could be removed and stored while the cases were being assayed, and staff to remove the movements, mark the cases with the sponsor's punch, and replace the movements once the hallmarked cases were returned. Some Swiss and American companies already had branches or agents with substantial businesses in the UK, and these were able to put in hand the necessary premises and staff to process watches for hallmarking, but many smaller Swiss companies simply had travelling sales representatives or small offices in London and could not afford the extra cost of setting up an office and workshop in Britain to process watches for hallmarking. From June 1907 many of these smaller Swiss companies arranged for Assay Agents in the UK to handle the hallmarking process for them. The largest of these in England were George Stockwell & Company, sponsor's mark "GS" and Robert Pringle and Sons, sponsor's mark "A·G·R". In the late nineteenth and early twentieth centuries, Stockwell & Company were a large company of commercial carriers, transporting goods across Europe like UPS, FedEx or City Link do today. Stockwell & Co. had branches in cities all over the UK, and also in many cities on the continent. Before June 1907 Stockwell and Co. were transporting parcels of watches from Switzerland into Britain, which included making the necessary arrangements to get the parcels cleared through British customs and paying the British import duty on behalf of the manufacturer. When the British law was changed in 1907 to require that all imported gold and silver watch cases be assayed and hallmarked, the Swiss manufacturers who used Stockwell & Co. to transport and import watches into Britain asked them to arrange arrange for the hallmarking as part of the import process, so Stockwell added this to their range of services. George Stockwell's sponsor's mark was first registered with the London Assay Office on 15 June 1907. You can read more about the history of the company at George Stockwell & Co.
From the middle of the nineteenth century Robert Pringle & Sons of 40/42 Clerkenwell Road, London, was one of the UK's largest wholesalers of jewellery, silverware, clocks and watches. I am not sure whether they imported watches before 1907 but it seems likely; they certainly did after 1907 as is shown by the large number of watches carrying their sponsor's mark. The sponsor's mark used by Robert Pringle and Sons on imported watches "A·G·R" was first registered on 25 June 1907 by Arthur George Rendell, who was one of the managers at Pringles. You can read more about the history of this company at Robert Pringle and Sons. The fact that both Stockwell & Company's and Robert Pringle & Sons marks were not registered until around the time that the new rules governing the hallmarking of imported gold and silver watches came into effect is rather curious, it indicates that they and their Swiss customers were not prepared for the new rules. One of the largest importers of Swiss watches at the time was Dimier Brothers, who had factories in Switzerland and an office in London. They were evidently well aware of what was going on and had registered their mark on 12 December 1906, less than two weeks after the judgment in the Court of Appeal that resulted in all foreign watches being hallmarked in the UK and more than six months before the change in the law cam into effect. You can read more about this company at Dimier Brothers. In Scotland it appears that James Weir of Glasgow acted for many companies, but this needs further research. From June 1907 there was a flood of foreign watch cases to be hallmarked. The number of silver watch cases received at the London Assay Office in the hallmarking year to 29 May 1908 was approximately 200,000, compared with only 3,000 for the previous hallmarking year of 1906 to 1907. It can be inferred that the 3,000 were all of UK manufacture, and the difference of 197,000 was made up of foreign watch cases. By the 1912 to 1913 hallmarking year the number of silver watch cases marked at the London Assay Office was around 700,000, reaching a peak in 1918 of more than 1.25 million. There was a similar increase in the number of gold watch cases. In the hallmarking year to 29 May 1908 this was approximately 78,500, compared with only 4,700 for the previous hallmarking year of 1906 to 1907. By the 1912 to 1913 hallmarking year the number of gold watch cases marked at the London Assay Office was around 255,000, then declined due to the war, and sharply declined after an ad valorem import duty duty of 33.⅓% was imposed in 1915 on imported luxuries, including clocks and watches, to conserve foreign currency reserves as part of the war effort. Silver watches were also subject to the tax, but as they were cheaper than gold watches their numbers didn't suffer the same decline. Nearly all the watch cases hallmarked at the London Assay Office between 1908 and 1918 were of Swiss manufacture. It appears that the new rules still didn't stop the import of watches in unhallmarked cases entirely. In the House of Commons on 1 April 1914 Mr. Burgoyne asked the President of the Board of Trade Mr. Montagu whether he was aware that "... no steps have been taken to prevent the importation of watch cases by registered letter post, with the result that such goods are sold in this country in contravention of the law as to hall-marking ... ". Mr Montagu said that he would look into the matter and presumably the practice was stopped. I thank Richard Edwards for drawing my attention to the general lack of the required UK hallmarks on Swiss watches imported prior to 1907. Richard has been collecting watches for many years and he tells me that although perhaps 5-10% of Swiss watches from before 1907 bear UK hallmarks, he has never seen one with the "F" as required by the 1867 Act, nor has he ever seen a watch with the "Foreign" marks introduced by the 1887 Act, or with the style of import marks in force from 1904 to 1906. It appears that a small number of Swiss watchmakers decided to take advantage of the 1842 act to make better forgeries of English watches by getting their cases stamped with UK hallmarks, whilst the vast majority, aided by the UK Board of Customs, simply bypassed the legal requirements. When the ability to get the usual UK hallmarks stamped in foreign cases was effectively terminated by the 1887 Act with the introduction of completely different marks for foreign made watch cases, Swiss makers no longer sent any cases for hallmarking until the error of the Board of Customs in allowing this to happen was discovered. From 1 June 1907 all imported watches were correctly hallmarked. 1867 Customs Amendment Act Letter "F" in addition to the usual hallmarks UK hallmarks + "F" UK hallmarks + "F"
1876 Customs (Tariff) Act Letter "F" in addition to the usual hallmarks UK hallmarks + "F" UK hallmarks + "F"
From 1300 the standard for gold was "the touch of Paris" (19.2 carats). In 1477 a statute of Edward IV (17 Ed. 4. c. 1.) reduced the standard to 18 carats, but it was restored in 1575 by Queen Elizabeth (18 Eliz. c.15) to 22 carats, which remains the standard to this day. In 1797 watchmakers petitioned the government for a standard lower than 22 carat, which was the only standard permitted at the time, so that they could compete with Swiss makers who used 14 carat gold, which was very popular on the continent and recognised as a legal standard in many countries. The watchmakers stated that a 22 carat gold watch case cost twice as much to make as a 14 carat case. The Goldsmiths' Company did not object in principle, but suggested that the new lower standard should not be less than 18 carats. This suggestion was accepted and an additional standard of 18 carats was introduced by the Gold Plate (Standard) Act of 1798 (38 Geo. III c. 69). A new mark of a crown and the number 18 were to be used, the lion passant continued to signify the 22 carat standard. In 1846 watch and watch case makers in Birmingham and Coventry petitioned the Government requesting a minimum standard for gold lower than 18 carats. They stated that their export trade of gold watches to the United States was hampered by this because the French and Swiss could supply watches in gold cases of lower standard, which were therefore cheaper than the UK made ones. Initially the Goldsmiths' Company and London watchmakers resisted, but eventually the Government responded positively to the request. The Gold and Silver Wares Act 1854 allowed the Monarch to define additional lower standards for gold, down to 8 carats or one third gold, which was felt by Parliament (but not unanimously) at the time to be the lowest proportion of gold in an alloy that could still be called gold. An Order in Council passed in December 1854 allowed additional standards of 15, 12 and 9 carat. The introduction of the standards of 15, 12 and 9 carat appears with hindsight to have been an over reaction. Simply allowing the widely used continental standard of 14 carats, in addition to 18 and 22 carat, would have been a perfectly adequate response to the watch makers request for a level playing field, and the standard of 9 carat, which many considered at the time to be of too low gold content to be called "gold", could have been avoided. Mr Joseph Henley, the member for Oxfordshire, said that the object of the 1854 bill "appeared to be to stamp as gold something not much better than brass". The select Committee of the House of Commons on the Hall-Marking of Gold and Silver Plate which reported in May 1879 recommended that the standards of 15, 12 and 9 carat be discontinued, saying A composition containing less than two-thirds of pure metal ought not to be called by the name of that metal. That would be 16 carat or 0.67 fineness, a standard that was not adopted. In fact, the Committee probably didn't realise that the composition of nine carat gold contained even less like gold than the bare figures suggest. The proportions are based on weight, but gold is much denser than the metals it is alloyed with, usually silver and copper, and in some colours of nine carat gold the proportion of fine gold by volume can be as low as 20%, although of course it must always be at least 37.5% gold by weight. The 15 and 12 carat standards did not prove popular and by Order in Council in 1932 they were both replaced by a standard of 14 carat. The standard of 9 carat was retained. In June 1933 the Swiss authorities responded by introducing 9 carat (375) as a legal standard in Switzerland - but only for watch cases. The symbol the Swiss chose for this new lower standard was the morgenstern, a medieval spiked club or mace. As the Swiss symbols for other standards of gold and silver were quite innocuous, the head of Helvetia for 18 carat gold and animals for the other standards, the use of this war-like symbol for the lower standard of purity, to be used for watch cases only, was perhaps pointedly to show that it was as a result of a (trade) war. The direct cost, the fee charged by the assay office, and also indirect costs of hallmarking, raises the question of whether the practice of hallmarking, by keeping the cost of gold and silver watch cases high, higher than those of foreign watch cases, impeded the democratisation of English watchmaking in the nineteenth century. Although few could afford gold watches, silver was the material of choice for the majority of watch cases until stainless steel came along in the 1930s. By keeping the cost of English watches high so that they could only be afforded by the wealthy, poorer people were pushed towards buying imported watches with silver cases that mostly, until 1907, did not receive British hallmarks. There were two indirect costs to the manufacturer as a result of hallmarking English watches. The first of these was that watch cases had to be made of a sufficiently thick metal to take the punch marks. Imported watches that were not going to be hallmarked could be made of thinner, and therefore cheaper, material. And secondly, hallmarked watch cases needed extra work, called "rectification" to restore their shape and finish after they had been "drawn" at the assay office and punched with hallmarks. "Drawing" is the assay office term for taking samples of material which left scars that had to be polished out. Stamping the hallmarks could also distort the case and leave marks on the metal on the opposite side to where the punch had been applied. ... in heavy gold cases the injury done is, in a great measure, restorable ; in slight cases, which constitute the larger number, the restoration forms a large portion of the cost of manufacture, and the process of restoration is a permanent injury to the work, and seldom fully successful, while in cases for ladies' watches, such as Swiss manufacturers import into this country, in such constantly increasing numbers, the process of the Hall would be so fatal that as an article of manufacture in this country they have scarcely any place. The cost of stamping a case being one shilling and eightpence, and the cost of restoring a light case and completing it after the mal-treatment at the Hall being about one-third of the cost of making, which being averaged at twenty shillings for each case, gives six shillings and eight-pence as the extra cost belonging to the Goldsmiths' Hall process, it follows that for a protection which on an average cannot exceed ten shillings and sixpence, the public are on every case charged eight shillings and fourpence. This discussion made me think that any efforts by English watchmakers to compete with the Swiss by making cheaper watches would be frustrated by the requirements for hallmarking. Watches at the time had, for fashion and public taste, to have cases of gold or silver, and although lower standards for gold of 15, 12 and 9 carats had been allowed in 1854 in response to watchmakers requests, the cases would still have to be substantial to withstand the hallmarking process, and the cost of the hallmarking and rectification a greater proportion of a cheaper case than a more expensive one. This would surely have frustrated any British manufacturer who decided to compete with imports by setting up to make cheaper watches, because the price of the case would be increased so much by the need to withstand hallmarking process, which until 1 June 1907 was avoided by imported watches. Could this be the reason that English made watches always remained high-end items: that attempts to develop cheaper, mass market, English watches never even got started in the first place? British gold and silver cases could not be made cheaper because of the requirement that they be hallmarked, and it would be pointless to put a cheap watch in an expensive case. When all imported gold and silver watch cases were required to be hallmarked there was concern amongst the importers that the stamps would damage the cases. Discussions took place with the assay offices and a solution, which presumably involved lighter punching, was arrived at. The assay process is quite interesting. Because it is a quantitative process to determine the relative amounts of the precious metal, the gold or silver, relative to the alloying elements mixed with it, it used to require that a relatively large sample of material was taken, and essentially destroyed by the analysis. Gold is assayed by cupellation or "fire assay" where an accurately weighed sample is mixed with silver and lead and placed in a small vessel called a cupel, which is made of absorbent refractory material. This is then heated in a furnace to melt all the contents. All alloying elements and impurities except for gold and silver are absorbed by the cupel. The remaining gold and silver alloy is then treated in nitric acid to remove the silver, and the weight of the pure gold remaining can be compared to that of the original sample to determine the fineness of the sample. The purity of the gold used to be marked as both carats and as a decimal fraction, although now sometimes only fractions are marked. Pure gold is 24 carat so, for example, 18 carat gold items were marked with both an "18" and a ".75" with the .75 meaning 18/24 = 0.75 or 75% gold. The carats used in describing the purity of gold are related to the carats used for the weight of gem stones such as diamonds, but are used in a different way. The troy pound, a measure of weight used for precious metals, contains 12 troy ounces or 24 "pound carats". The early statutes for gold standards, from the time of King Edward I to Queen Elizabeth, expressed the gold standard in terms of these pound carats, e.g. "a fineness of 22 carats in the pound troy". This was later abbreviated to simply "22 carats", which is where we get the terms used today. But the stated carat purity of gold is always short for a ratio of the stated carats to 24, so 18 carat gold is 18/24 = 0.750, or 75% gold. Diamonds and other gemstones are weighed in units of carats, but their purity is described qualitatively in terms of colour and clarity. A gem stone carat is equal to 0.200 gram, and its subdivision, the point, is 0.01 carat. So just remember that a gold carat tells you what proportion of gold is in the metal, not how much metal you are getting. Whereas a diamond carat tells you exactly how much diamond you are getting, but not how pure it is. Silver purity is only expressed as a fraction, and only two standards are authorised in Britain: Sterling 0.925 and Britannia 0.9584. Sterling silver is an alloy of silver containing 92.5% by mass of silver and 7.5% by mass of other metals, usually copper. Britannia silver has a slightly higher silver content at 95.8% and was introduced in 1696 instead of the Sterling standard to stop people melting down silver coins to make silverware. Britannia was the minimum standard for silver items until 1720 when Sterling was reintroduced, and both standards are still in use today. Silver was also originally assayed by cupellation but later a process of titration is used. The accurately weighed silver sample is dissolved in nitric acid to form silver nitrate. Measured quantities of sodium chloride (salt) are added, reacting with the silver nitrate to form silver chloride, and when the silver nitrate is completely turned to silver chloride, the amount of silver in the original sample can be determined from the quantity of sodium chloride used. Obviously it would not be practical to perform these assay tests if thousands of items were submitted for assay, because it would require a noticeable amount of metal to be removed from each item, and would take far too much time. When large numbers of items are to hallmarked, a system of batch processing is used. The registered sponsor submits a items to be tested in batches with an accompanying hallnote. The items in the batch are grouped together into lots of the same metal and same purity, and can include some offcuts or scrap pieces of the same purity. When the assay office receives a batch of items, the individual lots within the batch are first checked for homogeneity by carrying out " touch tests" on the articles. The articles are lightly rubbed onto a "touchstone" leaving a trace of material on the stone. The sampler then checks the colour and reaction to chemicals of the trace on the touchstone, to make sure that all the individual items are of the same purity. Once satisfied that the items in the batch are all the same metal and purity, one of the items in the batch has a small amount of material taken from it for assay. This is where the offcuts or scrap pieces come in; because they have been checked to make sure that they are the same fineness as the rest of the items in the batch, they can be used for the assay without causing any further damage to the finished pieces. Today silver is assayed by X-ray fluorescence spectroscopy which is very fast and has the benefit that there is no need to scrape a sample of material off the titem being assayed. Silver does not react with oxygen, which is why it is regarded as one of the noble metals. When it is cleaned and polished silver has a very bright almost white shiny surface. This gradually darkens and becomes less shiny as the silver reacts with sulfur-containing substances, forming a layer of black silver sulphide on the surface. This layer protects the metal underneath, but it is not very pretty. Take a pan or heat resistant dish large enough to contain the silver item you want to clean. Line the pan or dish with new aluminium foil and stand the silver item on the foil. Take enough water to cover the item and heat it to boiling. Add baking soda to the hot water, one cup of baking soda per gallon of water - be careful, it may froth up. Pour the hot water into the pan containing the silver item, covering the item. When the silver is clean, remove it from the solution, rinse with clean warm water and dry with a soft cloth. This works because the aluminium has a stronger affinity for the sulphur than does the silver. The solution of baking soda carries the sulphur from the silver to the aluminium, forming aluminium sulphide. It is an electrochemical reaction and a small electric current passes between the aluminium and the silver, which is why they must be in contact. The reaction works faster when the solution is hot. Please note that this method will remove tarnish, the thin black film that accumulates on clean silver, but it will not remove ingrained dirt, such as will have accumulated over years of wear on old jewellery, watch chains, watches, etc. This kind of ingrained dirt is very difficult to remove with polishes, chemical cleaners or by hand, but an ultrasonic cleaning bath can remove years of ingrained dirt effortlessly and bring the item up much better than anything you could achieve by hand. If you have a competent local jeweller, it is worth asking if he has an ultrasonic tank. Many jewellers will cleans items in their ultrasonic bath for nothing, the cost to them is negligible and it is good customer relations. Because gold and silver have always been expensive, many cheaper ways to make items look like gold and silver have been developed over the years. These can be broadly divided into two categories; plated, where a thin layer of the precious metal is applied to the surface of an item made from base metal, and alloys, mixtures of metals making an alloy whose colour resembles that of the precious metal. If any item is described as silver or gold and doesn't carry any hallmarks, it pays you to be very careful. Ask the vendor how they know it is what they say it is, and be cautious about the answer. With the difference in price between precious and base metals, it could be an expensive mistake. And if it has been tested with one of the testing kits available, bear in mind that they can only test the surface of the metal; it could be just a surface plating. Hallmarking guarantees that the metal is the same all the way through. Archaically the term "plate" was derived from the Spanish for silver, "plata". It was first used to refer to items made of silver, and then later to items of silver or gold. But with the introduction of Sheffield plate, and later eletro plating, it became easy confuse the term " plate" between items made of the solid metal and items made of base metal overlaid ("plated") with silver or gold. Because of this I try to avoid the use of the term plate, but the reader should be aware that some older books, Bradbury in particular, when they say "plate" actually mean the solid stuff, not plated items. Sheffield plate was invented by Thomas Boulsover around 1743. It was made by fusing sheets of sterling silver to a base of a copper ingot, the sandwich was then rolled thinner to produce thin sheet material. The resulting material was termed Sheffield "plate" rather than "plated", possibly because a sheet of solid silver was used, and this seems to be where the confusion started. This process puts relatively thick layers of metal onto the base metal, which will wear for many years before the base metal shows through. Sheets of Sheffield plate were made into household items that looked identical to more expensive solid silver items. Because the copper core would shown through on cut edges these were either rolled over so that the copper didn't show, or silver wire was soldered to the edges to cover the copper. Items of Sheffield plate could not be hallmarked, but makers devised their own marks which sometimes resemble hallmarks. When the same process as Sheffield plate is done with gold the result is called "gold filled" (which may have the initials GF) or "rolled gold" (which may have the initials RG or RGP) depending on the thickness of the gold over the base metal, gold filled should be thicker, and therefore wear longer, than rolled gold. The thinnest layers of gold or silver are applied by electroplating, in which a thin layer of gold or silver is deposited chemically and which can range in thickness from ½ micron (1 micron is 1 millionth of an metre; one thousandth of a millimetre or 0.00004 inches) upwards. The quantity of gold or silver used on electroplated items is so small that it is essentially negligible and costs very little. The electroplating process involves dissolving metal salts such as gold cyanide or silver nitrate in an electrolyte and then using an electric current to deposit the metal onto the item being plated. Different colours of plating, e.g. rose gold, can be achieved by using the right mixtures of plating solutions. Nickel silver, also known as German silver, is usually made of 60% copper, 20% nickel and 20% zinc. Nickel silver is named for its silvery appearance, but it contains no actual silver metal. The name "German silver" refers to its development by 19th-century German metalworkers in imitation of the Chinese alloy known as paktong. A gold coloured brass, an alloy of copper and zinc, called "Pinchbeck" was devised in the eighteenth century.